I awoke with a start as a train approached, not due to loud rumbling, but due to the ground shaking under my sleeping bag. It was 3:30am and a heavily laden freight train was headed north on tracks located just across the river, about 30 yards from my tent. We were guerrilla camping along the Tioughnioga River in upstate New York paralleled by a little used railroad line. It was the only train we heard or saw during our trip down river, but its timing was exquisite. After the train passed I snoozed a little and then woke up to the sounds of wild turkeys coming off their roosts on the nearby hillside. My companions and I cooked breakfast, enjoyed a cup of coffee, packed our gear and were on the river paddling by 8am, continuing our May multi-day trip downstream to our take-out at Chenango Forks. What is Guerrilla Camping? Sometimes referred to as stealth camping, commando camping or ninja camping, guerrilla camping is simply camping where you aren’t supposed to, usually for one night, while making great efforts to leave no evidence of your presence either during your stay or after you leave. The Popularity of Guerrilla Camping. Guerrilla, stealth or gypsy camping is popularly practiced by cross country cyclists and backpackers; less commonly by RVers and urban campers. In the United Kingdom, it’s called “Wild Camping”. My RV acquaintance calls it “boondocking” when staying in rural areas or “wallydocking” when he parks his VW van for an illicit stay at a WalMart or similar retail parking lot. There are web sites and forums which discuss guerrilla camping but the practice is less commonly talked about among paddlers. This is likely due to the greater flexibility in which hikers and cyclists can alter their route to take advantage of ad hoc camping opportunities and the greater ease in which they can hide/camouflage their gear. Why Guerrilla Camp? There are several reasons why I prefer guerrilla camping over a typical public or private campground. 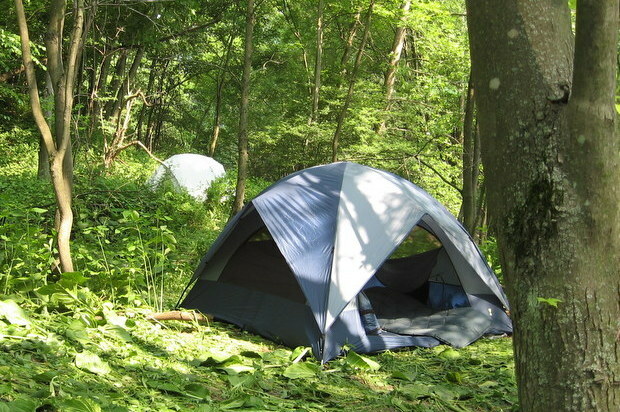 Camping in a hidden corner is usually quieter than a developed campsite. At public campsites you can get stuck with noisy neighbors while guerrilla camping the chance of being bothered by other people is slim. Most commonly used campgrounds have wildlife (e.g. crows, raccoons, skunks, chipmunks and squirrels) habituated to free food. While some campers may find them cute, I find them annoying. Stealth camping is a cleaner and quieter way to camp. In all likelihood no one has camped at your impromptu stealth-site before and the ground will be pristine. Use of guerrilla camping tactics provides multi-day paddling trips that would otherwise only be accessible for day trips. In Upstate New York, where I live, the southern tier is crossed by several long flat water rivers. The Susquehanna, Chenango, Unadilla, Tioughnioga Rivers provide opportunities for trips from 40 – 90+ miles – if you can find campsites along the way. 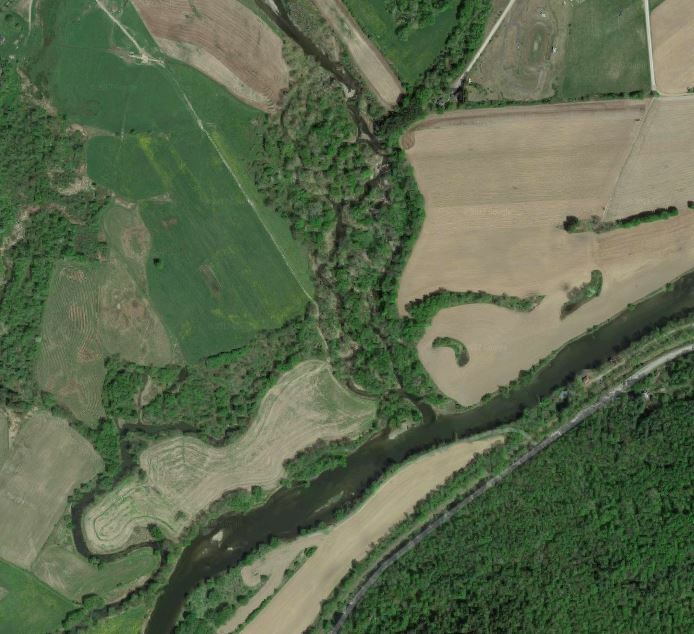 These islands in the Susquehanna River are worth inspecting. Public lands such as national forests, grasslands, and BLM land should be considered first. You can camp for free on the aforementioned friendly public lands, as long as you’re outside of developed campgrounds and not in an area explicitly marked as closed to camping. Find a flat spot an appropriate distance from trails and waterways, practice good Leave No Trace habits, and don’t overstay your welcome. You’re required to move camp after 14 days in a national forest and after 21 on BLM land. If you’re traveling in the western half of the US, start with this interactive map of public lands to get a feel for where you might be able to rest your head. Also, these two databases are full of crowd-sourced free camping spots. There are 450 million acres of public land in the United States, but the vast majority of that is in the states west of the Mississippi. Nevada has the most public land of any state; Oregon, Washington, Idaho, Utah, Colorado, Arizona, Wyoming, and Alaska round out the top ten. Not having available public lands, a good guerrilla campsite should be out of sight of housing, not on developed land such as a golf course (you would be surprised how early those crazy golfers start), not on land that is marked ‘No Camping’ or ‘No Trespassing’ and away from roads and footpaths. Look to avoid “party sites” by checking for trash and staying away from areas offering easy car access. Avoid field entrances, parking sites and roadside pullovers which can be easily checked. Favorite sites include islands, wooded stream tributaries, railroad right of ways, a farmer’s back forty and old bridge crossings which are no longer operational but where right of way issues may still be confused. Out of the way cemeteries and sports fields can offer protected places to sleep. Look for sites screened by small trees and thick brushy growth. Ideally find a spot not visible from nearby road grades. These reference sites have data source licensing agreements and frequently have different imagery. 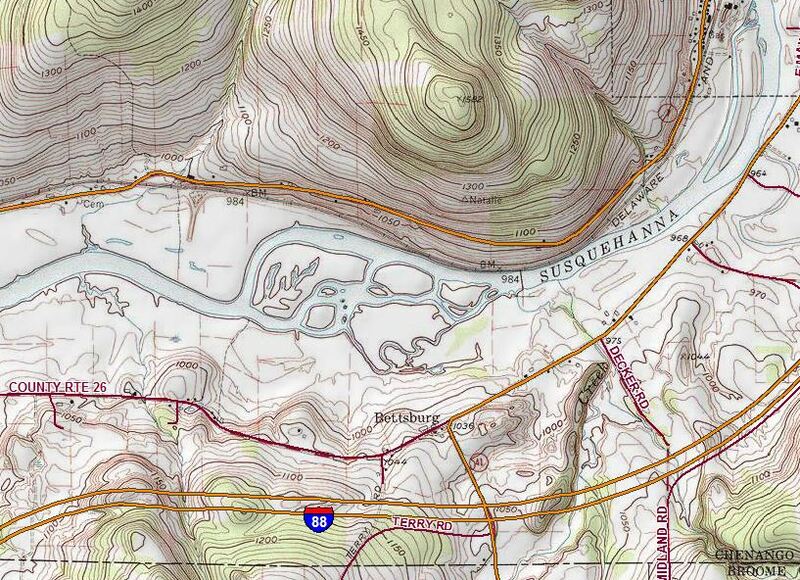 You may discover potential camping sites such as the wooded tributary shown below. This wooded tributary may provide a secluded campsite. Other camping possibilities include parks or baseball fields, cemeteries, rural churches or fairgrounds, but these carry a higher risk of detection. You should check with local authorities for these locations. In smaller towns, law enforcement will often allow camping for small groups if there is no nearby campground. When to Guerrilla Camp. The peak outdoor activity months of June, July and August also provide the greatest risks for detection. Farmers are working their fields, fishermen are accessing favorite fishing spots, and river side camps become occupied. Consider an early spring or late fall trip down river to help avoid detection. How To Guerrilla Camp. The cardinal rule of guerrilla camping is to not attract unwanted attention. Plan your paddling schedule to arrive at your planned site late and leave early. Cook meals away from the intended campsite. Don’t start a fire and adhere to Leave No Trace principles. Use of hammocks can reduce your overnight impact. When you leave your site there should be no signs of habitation. Potential Pitfalls of Guerrilla Camping. At a typical camp ground you do have the opportunity to meet other people, take showers, do laundry and buy supplies. Stealth camping may impose limitations on your camping experience that might make it unacceptable to you. Hiding your evidence of disturbance after you leave requires effort and attention to detail. Free roaming and/or guard dogs can pose a risk in that they hear everything and, rightly, consider it their job to alert the world of your trespassing. Of course, there is always the risk of detection. If asked by a land owner to move on do it right away without argument so you are not trespassing. If you damage property including agricultural crops you are liable for civil suits. Conclusion. Guerrilla camping isn’t for the faint hearted or the inexperienced camper. Guerrilla camping requires rigorous attention to Leave No Trace principles and generally requires more research and pre-planning. Attention to the details of the trip will make the difference between having a secret and secure camp site and having a long tiring paddle to finish out a trip.